Polycystic ovary syndrome (PCOS) is a disorder experienced by women of reproductive age. While diet and lifestyle have been recommended to reverse the condition, essential oils for PCOS are becoming a go-to natural treatment. PCOS is a hormonal problem that leads to infrequent or prolonged menstrual periods or excessive male hormone levels. The ovaries are known to develop small collections of fluid and fail to release eggs in many women who suffer from PCOS. While the exact cause of PCOS continues to be a source of research, early diagnosis and treatment of the disorder are said to reduce the risk of complications. Long-term complications include type-2 diabetes and heart disease. Some people call essential oils for PCOS a “powerful” management tool. Why Use Essential Oils for PCOS? Many people have heard about aromatherapists using essential oils to help people improve their general health and well-being. However, the idea of using essential oils for PCOS may be a new concept to you. Essential oils are potent oils from plants that have been used in a variety of ways around the world. Here’s why you might consider treating PCOS with essential oils — essential oils stimulate the olfactory system of the brain, which controls our sense of smell. When the limbic system of the brain senses the aroma of essential oils, it releases chemicals to help restore hormonal balance. Research suggests that some oils improve insulin sensitivity while others may ease various PCOS symptoms. Since PCOS can make some women more prone to endocrine disruption, essential oils for PCOS can be part of a natural skincare routine. The nice part about essential oils is that unlike many medicines, essential oils can impact health without causing any negative side effects in a lot of cases. Unfortunately, PCOS is defined by a long list of symptoms, including irregular periods, difficulty conceiving, weight gain, hair loss or excessive hair growth, as well as acne and other skin problems. Since there are so many symptoms, there are many essential oils that have the potential to address PCOS. Here’s a look at some of the essential oils for polycystic ovaries. This essential oil has been known to help improve estrogen imbalance. It has calming properties that can support women who experience hormonal mood swings. It has been suggested that Clary Sage essential oil is a uterine tonic that can help regulate periods. Some people say that it has helped them fight acne as well. Studies indicate that thyme essential oil contains a plant-based progesterone that can help with weight gain, mood swings, and hot flashes. It can be a good option for those who are having difficulty with regular ovulation due to low levels of progesterone. Some people believe that sandalwood essential oil can balance out testosterone levels in women and men. It has been known to help women who are dealing with acne. It has a pleasant fragrance and is said to help improve low libido, which can be a sign of PCOS. The interesting part about geranium essential oil is that aromatherapists suggest that it stimulates the adrenal cortex of the brain, which can help balance hormones. Studies also indicate that it is a natural anti-depressant. Some research shows that geranium essential oil can reduce anxiety by as much as 18 percent. In traditional folk medicine, geranium oil is thought to be an ovarian tonic. This is a very popular essential oil due to its amazing scent. People looking to relieve stress as well as PMS symptoms have used lavender essential oil for many years. Pain and cramping are common in those who suffer from PCOS and lavender essential oil can help ease such symptoms. Anyone who has difficulty sleeping due to PCOS can put a few drops of lavender oil on their pillow to help promote better rest. Some women with PCOS are dealing with insulin resistance and cinnamon has the ability to improve this sensitivity. Animal studies show that cinnamon essential oil has a regulating impact on blood glucose level and lipids. There also seems to be some evidence to suggest that this oil can impact appetite and therefore assist with losing weight. This essential oil can help with insulin resistance and elevated blood sugar levels. Black Cumin has been used for centuries to treat diabetes, Alzheimer’s disease, and migraine headaches. Some studies indicate that just two grams of the black seed could lead to a reduction in fasting blood sugar levels. With an exotic fragrance, Ylang Ylang helps balance out skin oils, improve hair growth, and improve fertility. A study in Portugal has demonstrated that women with hormonal disruption, which can be a sign of PCOS, showed clear evidence of improved self-esteem with Ylang Ylang essential oil. Depression and self-esteem have been linked to hormonal disruption. Some women who suffer from PCOS also experience anger and depression, but German chamomile oil can help with these symptoms. Additionally, this oil has the potential to help with ovarian cysts that make conception difficult. This essential oil has the ability to relax the uterus. It also helps people with PCOS fight depression. Research suggests that spearmint essential oil helps decrease body weight in those dealing with PCOS. Studies also show that spearmint can assist with type 2 diabetes and decrease oxidative stress. There are three ways you can use essential oils for polycystic ovaries. Often, women try each method before deciding which they are most comfortable with or which they find most effective. This is also called diffusion and involves using a vaporizer or humidifier to help the scent of the essential oils fill up a room. Diffusing only takes a few drops of essential oil and there is no contact with the skin. Some people open up a bottle of essential oil and take a couple sniffs and then put the lid back on. Another approach for inhaling is to apply a few drops of oil to your pillow so you inhale the scent throughout the night. Massaging essential oils into the skin can be effective for PCOS pain, cramps, and bloating. However, it is best not to apply it directly to the skin because it is strong and could cause a reaction. Mix it in a carrier oil, such as coconut oil or castor oil, before applying. Some people prefer to use essential oils in a bath. If the bath is warm enough, it acts as a diffuser while at the same time the oil feels soothing on the skin. Very few essential oils are safe for consumption. Consulting with a natural health practitioner is a must if you are considering ingestion of essential oil. When deemed safe, the typical approach is to add a couple drops into a cup of herbal tea. Here are some sample essential oil recipes for PCOS. Mix the above ingredients in bath water and soak for 30 minutes. Mix the above ingredients and rub on the abdomen. Aside from helping ease some of the symptoms associated with PCOS, essential oils smell incredible and can be fun to work with when proper instructions are followed. 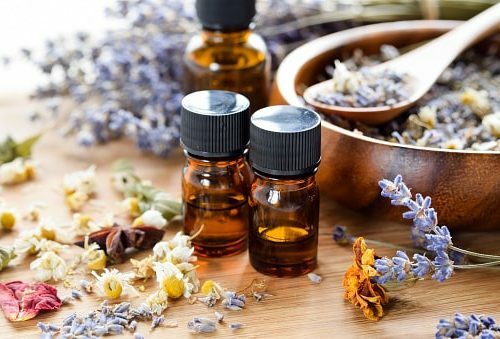 Market analysts predict the global essential oil market to reach 12.85 billion by 2023, as more people look for natural products. If you have never used essential oils for health purposes, we highly recommend you talk with a qualified aromatherapy expert or natural health practitioner first.